East Fife's players are all smiles after their win at the weekend. Picture b G McLuskie. The league season has returned and East Fife boss Gary Naysmith has set his sights on bettering last year’s fourth place finish. The Fifers were unable to reach the League One play-off finals after being beaten over two legs by Stenhousemuir. This year the gaffer is pretty black and white about where he wants the club to be come the season’s end. “I want promotion this year,” said the boss. That road starts this weekend when the Methil men travel to meet an East Stirlingshire side vastly improved over the past couple of seasons. “I went to watch them against Falkirk (in the League Cup) and they were competing well until Falkirk scored a worldy to make it 1-0,” said Naysmith. “After that they had to come out a bit and Falkirk were able to pick them off and scored another couple. “We had a couple of wins against them last season but they were really tough games. “I don’t think we could have been given a tougher start. There’s no doubt, though, the Fifers are flying at the moment and have burst out of pre-season with a coupleof very impressive performances against Championship clubs in cup competitions. First of all Falkirk needed until the first minute of injury time to struggle past. At the weekend there was no sense of disappointment as East Fife reached round two of the League Cup by seeing off Dumbarton. On Monday afternoon the cup draw paired the Fifers with Premiership side Motherwell. Naysmith says it’s an encounter the whole club can look forward to. He said: “It’s a good reward for the players and a chance to pit their wits against a team like that. “For me it’s also a chance to pit my wits against a manager from the Premiership. That freedom the Fifers have been playing with recently will come as little surprise when you learn the average age of the starting XI against Dumbarton was just 21. 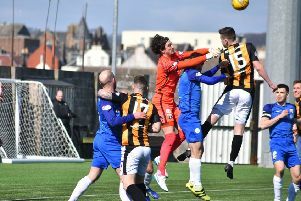 East Fife’s youngsters showed absolutely no fear against a Championship side which had added some decent signings to its squad over the summer. “I didn’t know the average age was 21 at the time of the game but it has worked for us,” said the boss. “The thing about young players is that they listen and they want to learn from you. “It wasn’t that I tried to get a team that young together but it’s just the way things worked out. “A lot of that is down to the money that we can offer players. The boss will have Kevin Smith back from suspension for Saturday’s trip to the central belt. Jason Kerr, on loan from St Johnstone, was unavailable for selection at the weekend with his parent club not wanting him cup-tied, so he too should return.